The London Food Tour is a chance to binge on select British and world-culture foods, to get to know London from the inside, to meet some colorful locals, and of course to eat well. We explore Borough Market south of the Thames, London’s oldest food market ever since the Middle Ages. The guide loves food and has a knack for good stories. S/he is also a born-and-raised local with plenty of insider’s insights to share. Our meeting point is not far from the main entraince of the Market, looking at the Shard modern building just before entering the oldest market in London, hidden in Art Deco building from the 19th century. The group is small, and the guide inquires there and then as to what each guest wants to eat and explore. The guide also provides anecdotes to illustrate the peculiar history of British food – do you know why fish & chips came to be? And how about the cucumber sandwich? and we’ll be sure to sample authentic drinks such a local craft beer or true English tea. We make the most of Borough Market – a unique, historical non-profit that aims to advance better eating for Londoners. We learn the strategy and the priorities of the Market’ Directors, we enter historical landmarks, we visit award-winning food makers, and we chat with engaging purveyors. We discuss the influence of British cooking – dishes that are part and parcel of our lives include bacon & egg, the “Sandwich” (after Earl Sandwich) etc. We make several stops to sample the foods we’ve just picked, to discuss them, and to decide what to eat next. Like any food lover, each tour will make room for the particular season and the delivery of the day. We meet outside Tube station London Bridge, outside NatWest Bank. Official address is 10 Southwark Street, SE1 1TJ. For iconic British foods from select purveyors and for new tastes you didn’t even know exist. For fun culture shocks from the country of plum pudding and cucumber sandwich. 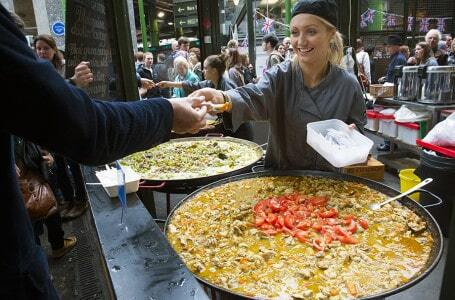 London Food tour is £ 55/adult, £ 35 for kids age 17 and under. We require a minimum booking of 2 people on this tour. The walking tour ends outside the Borough market. Our food tour includes : a tour guide for your walking tour + a sampling of foods. Food Tour does not include : gratuities for the guide (optional).